Wil Cormier’s natural gift for painting was evident from an early age. His enthusiasm for painting marine life was born during his teen years while working as a lab technician for his father on an island off the coast of Georgia. His father was a Marine Biochemistry Professor specializing in the study of bioluminescent sea creatures. 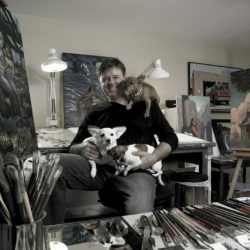 Wil started his career as an illustrator after graduating from the prestigious Art Center College of Design in 1983. He studied human anatomy extensively and drew and painted from live figures for many years to sharpen his natural talent. He used various mediums such as gouache, pen and ink, scratch board, water colors, pastels, prisma pencils, acrylic and oil paints. He went on to become well known in the Hollywood entertainment industry for his movie poster illustrations including Home Alone 2, Crocodile Dundee, Oscar, Navy Seals, Witches of Eastwick and Naked Gun 1 & 2. During this time he worked for such movie companies such as 20th Century Fox, Paramount Pictures, Warner Bros., and Disney to mention a few. He also taught at the Art Center College of Design to advanced graduating students in the field of Advertising Illustration. His imaginative art has earned him numerous awards in the entertainment industry. He has also received many honors from the World Science Fiction Association for his creative book covers. He has also had the opportunity to sell to art collectors through Sotheby’s in New York. Wil Cormier’s fine art series “Mermaids of the World” is now being joined by a tribute to Mel Fisher. This new series is drawing from two sunken ships called the “Nuestra Senora de Atocha” & the “Santa Margarita.” These ships, along with many others were sunk during a large hurricane on September 5th, 1622. Mel Fisher, his family & friends were to find the treasure of these ships 350 years later. To date, they have found hundreds of millions of dollars in gold, silver, & emeralds.